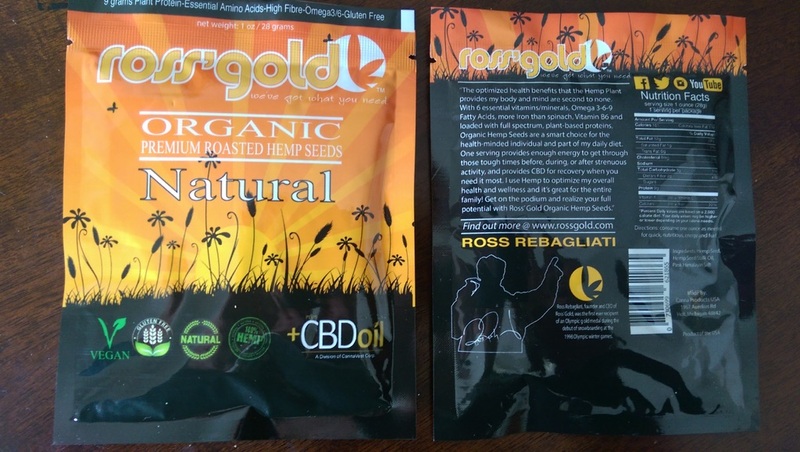 TORONTO, ON--(Marketwired - March 12, 2015) - Ross' Gold™, a division of Green and Hill Industries Inc. (OTC PINK: GHIL) (the "Company"), today announced that Ross' Gold™ Premium Organic Roasted Hemp infused with CBD are now available for sale. This launch is part of the Company's licensing agreement with Canna Products USA (CP USA) who plan to distribute and sell the Ross' Gold™ Hemp and CBD (Cannabidiol) products to their customers through online channels and third party retail outlets in the USA. Ross' Gold™ Premium Organic Roasted Hemp seeds are for the everyday health and wellness enthusiast who is looking to improve their diet through the use of natural, plant based foods. The premium organic hemp seeds are hand roasted and infused with Hemp CBD which has been touted for its anti-inflammatory, anti-bacterial, anti-anxiety and anti-depressant benefits. Hemps seeds also provide incredible nutritional benefits full of fiber, 9 grams of protein per serving and loaded with good dietary fats (Omega 3-6-9 fatty acids). Hemp seeds contain all 10 Essential Amino Acids (our body does not produce these!) which are building blocks for enzymes that help synthesize protein. Many people are protein deficient and can only get these 10 Essential Amino acids from foods introduced into their diet. The packages come in convenient 1oz pocket sized packs of Wild Honey flavor and may be found online for sale at http://michiganhempcompany.com/product/ross-gold-wild-honey-organic-hemp-seed/ or by contacting CP USA directly. Natural and Sweet & Spicy flavors will be available soon. Ross Rebagliati, CEO of Green and Hill, commented, "I eat Hemp seeds as part of my daily routine and Ross' Gold™ Premium Organic Roasted Hemp seeds are for those times when you need extra fuel or nutrition before, during or after strenuous activity. They also serve well as a light snack before bedtime. Hemp is a delicious and nutritious source of plant based protein and we've made it even better with added hemp CBD. " Founded in August 2013, CP USA offers a varied assortment of natural holistic remedies available for purchase online or in retail stores. Visit their website for store locations and wholesaler information at www.cannaproductsusa.com. Ross' Gold is building its brand to be a premium hemp product line and medical cannabis label internationally. The Company expects that its line of Ross' Gold retail products will be available in Canada by April 2015 including glass smoking products, water pipes, bubblers, hand pipes, water pipe parts & accessories, and concentrate parts & accessories, as well as vaporizers through a licensing partnership Ross' Gold will also be offering a wide variety of hemp products geared towards promoting a healthy lifestyle that are being rolled out in Q1 and Q2 2015 in the USA. The Company is also currently under a pre-development contract with a major production company for a television series tentatively titled Ross' Gold. Please visit www.rossgold.com for more information.